Another re-processed image using Topaz Glow. My previous posted image is here if you are interested in seeing the difference: http://www.jmannimages.com/Daily-2014/i-tQ7f8xT. This is very, very cool! I like the way this turned out. It is a wonderful painting feel to it. Nice job! I definitely prefer the original in this particular case, although the effect gives a look of paint strokes to this image that reminds me a bit of the oil paint filter in CS6. 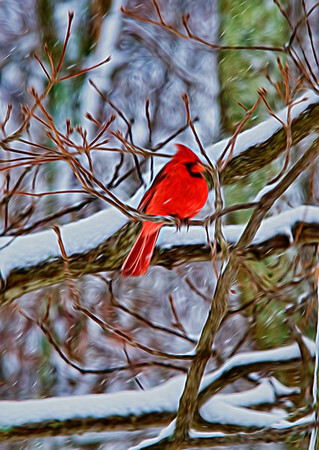 Something magical about a red cardinal in snowy setting. Well done. Good pp. I need to try topaz.